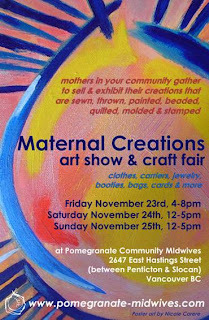 This year I'll participate at the Maternal Creations craft fair which will be held at Pomegranate Community Midwives clinic in Vancouver from November 23rd - 25th. I'll be selling my handfelted baby jackets, coffee cosy's, knitted caps and maybe some scarves. The only qualification for the show is to be a mother or a pregnant woman. The idea behind this is to recognize that making crafts is a way that women around the world sustain themselves and their families. Locally, women find that they are suddenly without work, either as they go on maternity leave or as they spend important time raising children. Pomegranate Community Midwives likes to offer Maternal Creations to these women as a venue to access the market and sell their hand-made crafts.